Scheduled Maintenance Plans from Hotsy Cleaning Systems, Inc.
Industrial-grade pressure washers are put through the paces, often used in dirty, dusty conditions. However, with proper care and scheduled check-ups you can extend the life of your pressure washer greatly. 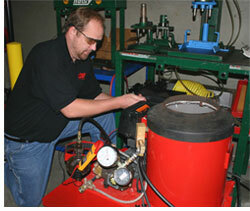 Hotsy Cleaning Systems, Inc. offers a scheduled maintenance program to keep your cleaning equipment working properly. Most pressure washer/steam cleaners are operated for long periods of time, and are not checked or repaired unless they break down. The pressure washer slowly decreases in pressure during operation due to a number of reasons: the coil being clogged with lime*; the unloader sticking; poor pump packings, etc. These cause an increase in labor hours to perform your cleaning jobs. Still not sure if you should sign up for scheduled maintenance? The advantages are many. For instance, the entire pressure washer is checked and tested with a pressure gauge to insure all systems are working satisfactory. The service technician reviews a check-off list and then recommends needed repairs. (Click here to see a copy of our checklist). You can choose to purchase parts and replace them yourself, have our technician perform the work if he has the parts in his truck, or you can have the tech replace the part on his next visit. In summary, you will save travel time of repeat service calls and only pay for parts and actual repair time required. Machines working at correct pressure save labor hours for cleaning and operate with less overall maintenance requirements. *NOTE: With Wisconsin water, if you do not have a water softener, the pressure washer will usually need deliming of the coil every three months or annually if you have a softener.